Take a closer look at the 12" iBook with this photo album. The CyberCooler Notebook Cooler NK-360 is a stove-like cooling pad for notebook computers with built-in triple fans for easy thermal heat dissipation, thus reducing the over-all temperature of your system for extreme high performance application. The cooler pad can be used with two types of power adapters: AC adapter for wall plug or USB adapter for the USB port of laptops. CyberCooler Silver Special Edition is available from Mcgail.com for $22. Booq announces the introduction of its stylish PowerSleeve12 for the new PowerBook G4 (12-inch). Based on the successful iBooq12 Sleeve design for the 12" iBook, PowerSleeve12 is optimized for Apple's most compact PowerBook to date. Made from extremely durable and lightweight 1680D ballistic nylon, this compact sleeve leaves room for magazines, notepad, power adapter or other accessories. The top-loading PowerSleeve12 sports 0.5" thick high-density foam padding all-around, Velcro flap, as well as Booq's signature detachable shoulder strap system that is so unique among compact laptop sleeves. With the addition of its stylish PowerSleeve12, Booq is bringing well-designed carrying solutions of the highest quality and finish to a new generation of PowerBook users. Priced at just $39, this well-rounded sleeve may prove to be irresistible to many PowerBook users. Just poking around Booq's site, we see the company has really gained steam from its original offering of just the BooqPaq 2 in one style. 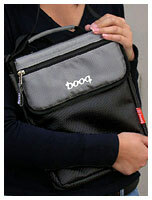 They've got a full line of sleeves, the original BooqPaq2 in both the black nylon and the leather-look accented version, and the Folee messenger. Interior Dimensions: 10.9" x 8.6" x 1.25"
Exterior Dimensions: 11.9" x 9.6" x 2.0"
Griffin Technology, Inc. has announced that internal testing has verified that their popular laptop stand, the iCurve, fits the newest PowerBooks released from Apple Computer last month. Both the 12-inch PowerBook G4 and the 17-inch PowerBook G4 rest comfortably and securely on the soft rubber friction strips on the top of the iCurve. The iCurve is a clear Lucite laptop stand designed specifically for Apple's PowerBook and iBook notebooks. It raises the screen up to an ergonomically correct position, elevates the notebook over the desk making room for an external keyboard and mouse, plus it aids in cooling for optimum CPU performance. The iCurve is available for purchase from Griffin Technology. "The response to the iCurve laptop stand has been amazing. Our customers are deciding that the iCurve, combined with their favorite keyboard and mouse, allows a notebook to function perfectly as their full-time desktop computer. The addition of an iCurve gives them the best of both worlds - the portability of a notebook with the comfort of a desktop," said Andrew Green, Griffin's vice president of Marketing. "The beautiful design and functionality of the iCurve complements Apple's newest line of PowerBooks perfectly." When positioned on the iCurve, the new 17" PowerBook G4 screen is raised to a total height of 16.5". The front edge of the PowerBook rests just below the tips of the arms, giving the impression that the PowerBook is floating above the desk. However the notebook remains securely at rest on the rubber friction pads directly underneath. When combined with an external keyboard and mouse, this configuration is the ultimate widescreen desktop replacement. The iCurve laptop stand is the ideal size for the new 12" PowerBook G4. When placed together, the width of both units is nearly identical. This gives the appearance of a perfectly matched compact desktop unit. The super-compressed 12" G4 notebook is kept running cool because the iCurve allows 360 degrees of air circulation at all times. The PowerBook is also given desktop mobility when the iCurve is used to rotate or reposition the entire setup. The Pouch carrying cases, made in The Pouch's Tucson factory, are fitted precisely to each make and model's dimensions and are made of tough, water-resistant Neoprene - and they are washable. The Pouch has better ergonomics. Laptops and notebooks are comfortably carried parallel to the spine, and you'll be less likely to run into objects and people in crowded situations. The formfitting Computer POUCH is a Real Space Saver if you ever wish to put your notebook or laptop in other luggage. Additional Storage: A big pleated, back-pocket with a flap secured with Velcro lies flat when not in use, but has plenty of room for power converter and cables. If portability and data exchange are your main concerns, MiniBank MT-II is the answer. Available as an empty case, MiniBank allows you to install a 2.5" IDE hard drive of any brand, size, or speed. MiniBank MT-II features not only an Oxford 911 chipset, for fast transfer rates via FireWire, but also a USB 2.0 port for a universal use. You can connect MiniBank MT-II to virtually any computer that has FireWire, USB 1.1, or USB 2.0 support. Wherever you are, your files will always be easily accessible. MiniBank MT-II has a solid painted aluminum case that gives the best possible protection to your hard drive and stored documents. Most modern drives are compatible with MiniBank MT-II. The small form factor of MiniBank MT-II allows you to easily carry it from one location to another. With MiniBank, you will always have your files handy. Bootable via FireWire on recent PowerMacs. Bus powered via USB or FireWire ports! MiniBank is bootable on PowerMacs G4, recent iMacs, iBooks, and PowerBooks. Simply install Mac OS 9 or OS X, select it as a startup disk, and you're ready. No external power supply is required, as MiniBank is powered by the USB or FireWire bus. MiniBank MT-II features a 400 Mb/sec FireWire port as well as a 480 Mb/sec USB 2.0 port. FireWire has an edge over USB 2.0 in terms of transfer speed, but USB 2.0's major advantage lies in its backward compatibility with existing USB 1.1 host cards, which you will find on virtually any recent computer. FireWire is natively supported by Mac OS 9 and X, Win98SE and higher. USB 2.0 is natively supported by Windows XP. Easy access and high quality aluminum case to allow fast and trouble free installation of a hard drive MiniBank MT-II has a user-friendly case making the installation of hard drives quick and easy. Designed by the engineering team of Miglia and made in Europe, the case is made out of 1.8 mm thick aluminum and the 5 mm front plate is machine-milled out of a solid bloc of aluminum. Metal confers better protection and much greater lifespan than plastic. MediaBank MT & MT-R are high quality external hard drive cases that feature one or two ATA/FireWire converters. Both units allow you to install one or two 3.5" ATA hard drives for a high storage capacity, ideal for backups or video capture. 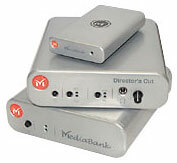 MediaBank MT-R ships with RAID 0 or 1 software for Windows 2000, Mac OS 9.x, and Mac OS 10.2. Optimize speed with a Raid level 0 (stripe) or increase security with a Raid level 1 (mirroring). For more information, visit Miglia.com. Addonics Technologies has announced a multi-format FireWire interface Flash memory reader/writer that allows both Macintosh and PC users to transfer digital media files at up to 400 Mbits/sec to seven different formats. The company also announced USB 2.0 compatibility for its Mini DigiDrive and Internal DigiDrive. The Addonics FireWire Mini DigiDrive is an ideal solution for anyone who needs fast media file transfers to their systems from digital cameras, digital camcorders, PDAs, MP3 players, or digital voice recorders. Addonics FireWire Mini DigiDrive eliminates the necessity to carry different types of Flash readers. With the FireWire Mini DigiDrive users can have multi-format compatibility with CF-I, CF-II, Smart Media, Memory Stick, Micro Drive, Multimedia Card, and Secure Digital Card media. The device can also simultaneously read/write to and exchange data among two different media types. The compact FireWire Mini DigiDrive measures 4.53" (W) x 1.2" (D) x 3.0" (H) and weighs just 5 ounces. The drive contains no moving parts. Users only need to plug device into any FireWire-compliant port to power the drive. To ensure compatibility with 6-pin and older 4-pin FireWire systems Addonics provides a standard 6-pin FireWire cable as well as an adapter cable that converts 6-pin FireWire to a 4-pin iLink port. The adapter cable is a Y cable with one end that connects to the iLink port and another end to the standard USB port. The small size, light weight and the FireWire self powered feature make the FireWire Mini DigiDrive a versatile and easy to use Flash memory reader/writer for computers running either Macintosh or Windows operating systems. Operating system support includes Windows 98SE, Me, 2000, XP, Mac OS 8.6 or higher. Once the drive is installed, an icon for each type of media automatically appears under the My Computer folder in Windows. List price of the Addonics FireWire Mini DigiDrive is $89 with software drivers, installation guide, FireWire cable, and 6-pin to 4-pin FireWire/iLink adapter. Addonics also gave two earlier members of its DigiDrive family a speed boost. The USB 2.0 standard increases the USB data transfer rate of 12 Mbits/sec to 480 Mbits/sec. The Addonics USB 2.0 Mini DigiDrive is a palm size solution, which measures 3.75" (W) x 3.18" (D) x 0.6" (H) and retails for $42. The Addonics USB 2.0 Internal DigiDrive fits any 3.5" drive bay and has a list price of $55. Both drives support the same seven media types as the FireWire Mini DigiDrive. 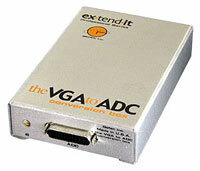 The Gefen ex•tend•it VGA to ADC Conversion Box connects analog video graphic (VGA) cards to Apple flat panel displays with ADC connections. The VGA to ADC Conversion Box enables any PowerBook G4 versions (before DVI) and the new 12" PowerBook G4 to connect to the family of Apple's flat panel displays. The VGA to ADC Conversion Box also enables users to connect PC laptops, PC desktops or other G4's using VGA (HD-15) connections only, to flat panel displays with ADC connection. Simply connect the supplied VGA (M-F) cable to the input side of the VGA to ADC Conversion Box. Then, connect the Apple flat panel display to the ADC output connector of the VGA to ADC Conversion Box. All VESA standard resolutions are supported. Also Apple resolutions for the 15" (1024 x 768) and 17" (1280 x 1024) Studio Display, 22" Cinema Display (1600 x 1024), 23" Cinema HD Display (1920 x 1200) and the new 20" Apple Cinema Display (1680x1050). Your analog video capabilities must include a minimum of 16 MB VRAM. Your Apple Flat Panel Display will only run at its native resolution when using the VGA to ADC Conversion Box. Note: This product will not work with the Formac ADC displays. This conversion box will not work with stock video card in the G3 Desktops, G3 PowerBooks, any iBooks, or any iMac.